The seventh grade program capitalizes on students’ developing ability to think conceptually and abstractly. It asks students to evaluate not only their roles in the community and their relationships to the world around them but also to see themselves as agents of change. 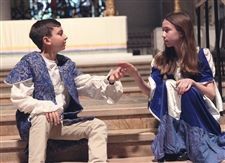 Cathedral’s seventh grade students have the opportunity to take center stage as they perform Shakespeare in The Cathedral of St. John the Divine. The Cathedral School employs the Exeter Math program for pre-algebra, which encourages independent and collaborative conceptual problem-solving. Students solve algebraic equations with all four operations, and with decimals, fractions, and variables on both sides. They investigate and graph linear, exponential, inverse, and quadratic relationships; explore and justify the Pythagorean theorem; and estimate square roots. Students are also introduced to factoring polynomials, especially trinomials with 1 as a coeficient of x2, and review the Distributive Property within the context of equivalent symbolic expressions. Cathedral seventh graders read and discuss historical and modern fiction, short stories, and poetry and analyze vocabulary drawn from the texts. They write personal narratives, essays, poetry, and historical fiction, concentrating on a review of grammar and the mechanics of writing with an emphasis on paragraph development. From January to March, they read and perform a play from Shakespeare in the Cathedral for the Elizabethan Evensong. The science curriculum for seventh grade begins with biology, including cell structure and function, cell transport, photosynthesis and cellular respiration, mitosis and meiosis, DNA, heredity and genetics, evolution and extinction, and human body systems and health. The study of science develops age-appropriate design thinking skills through problem-solving and STEAM-oriented activities. In the Upper School Science Lab, seventh graders continue their familiarity with laboratory activities, including lab reports, data analyses, and microscope use and dissection. Class time incorporates teacher-directed demonstrations, class lecture, and note-taking with group and individual projects. The Cathedral School requires Latin in the sixth, seventh and eighth grades. Students investigate grammar, syntax, and sentence translation through a disciplined approach. They undertake an intense study of sight translations, nouns and cases, verbs and tenses, and vocabulary roots. The course of study includes review of English grammar as it parallels the study of Latin grammar and uses questioning, textbook review, and drill practice to teach concepts. The social studies curriculum for the seventh grade focuses on ancient and medieval cultures. The course of study includes the geography of the Roman Empire, modern countries in Europe, the Middle East, and North Africa; the Roman Empire and its impact on European politics, culture, and architecture; the Middle Ages and the political, religious, and social components of that period. Students apply primary and secondary sources in generating a research paper on a topic in Medieval History. Throughout the year, field trips to The Cloisters and Butler Rare Book and Manuscript Library at Columbia University reinforce the curriculum. Cathedral seventh graders are taught in Spanish or French as much as possible, and all conversation, reading and writing is in the chosen world language focus. There is a concentration on intermediate grammar: additional verb tenses (past, future, conditional), direct and indirect object pronouns, negative expressions, and comparatives. Students continue to develop more sophisticated vocabulary and demonstrate and practice conversational skills and continue their exploration of Spanish- or French-speaking cultures. A foundational experience in Shakespearean language and culture, the Elizabethan Evensong curriculum prepares Cathedral’s seventh grade students for the rigors of studying Shakespeare in high school. This three-month project includes not only a deep study of figurative language and the fundamentals of drama, but also the building blocks of public speaking and presentation. Students analyze a Shakespeare play in the classroom and go on to rehearse and perform selections from it in The Cathedral of St. John the Divine for the whole school, with direction from a guest teaching artist. The performance also incorporates Renaissance music, dancing, and period costumes.